Sahib Sadhu is a biographical collection of stories that lead the reader through the adventures and challenges encountered by Swami Satyananda Saraswati. Swamiji performed the disciplines of a wandering ascetic for more than twenty years in India, chanting naked in the snow, meditating in hot springs, sitting for days at a time beside a sacred fire, walking the length and breadth of India, encountering snakes, miracle sadhus, rainmakers, healers, terrorists, palm readers, great saints and ultimately the Divine Mother. The stories are inspiring, captivatingly written and seemlessly infused with the timeless wisdom of a liberated soul. Included within the text are pictures from various periods of time in Swamiji’s life showing his emersion in worship and devotion to God. Sushil Choudhury was a Brahmin priest in a small village in the interior of East India when he met Swami Satyananda, an American sadhu who lived in the cremation grounds. He was thirteen years old when he joined the barefoot sadhu in spiritual pilgrimages all around India, throughout the Himalayas and ultimately around the world, following this Sahib Sadhu through some of the most fascinating spiritual adventures recorded in recent times. Sahib Sadhu is a very fun read full of deep interest for those inclined toward spiritual quests. The contents of these pages are apt to add octane to an aspirants efforts. Some might even find these tales to be high test rocket fuel with which to soar above the clouds. Still this book is not a tell all. There are gaps. It might have been even more interesting of a read if it all started when this Swami Satyananda character first set foot on the subcontinent. There are unanswered questions which may crop up in the minds of some readers. For instance, how did Satya come to develop his rapid fluency in the Indian languages which enabled him to go native so effectively? There had to be some sensible progression even to his rather accellerated learning curve. As informative of this book is, it creates plenty of mystery. Thumbs up to Sushil Choudhury and Shree Maa. This is one of the MOST INSPIRING books I have ever read!!!! It is unbelievable!!!! I read the whole book in one sitting and am still in awe. Please read, enjoy and be enthralled. 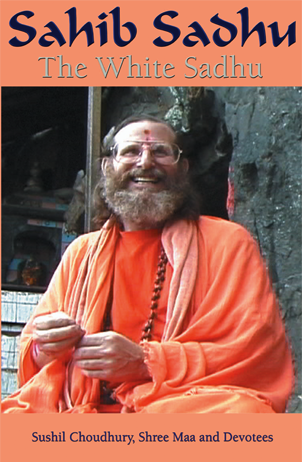 Stories from the life of Swami Satyananda are completely out-of-this-world. They are an example of how a human being can by sheer will power and dedication and love of God achieve the seemingly unachievable. This book is a spiritual-thriller. I recommend it in no uncertain terms to all spiritual aspirants nay, to all people everywhere! Come and hear the story of a rishi in our own times and wake up!!! I loved reading Sahib Sadhu. Hearing and learning about Swami Satyananda’s life was extremely interesting and inspiring. It is amazing how he overcame so many odds and worked so dedicatedly at his goals. What an honor to even know about such a person and be able to learn more about his life through the book â€œSahib Sadhu. I have got copies of this book to share with my friends and I strongly recommend it to all. Sahib Sadhu has become my all-time favorite book it is up there with the autobiographies of Swami Rama and Paramahamsa Yogananda. I am sure that any spiritual seeker belonging to any path will only be filled with inspiration, courage and hope by reading this book. Please do take the time to read it and treat yourself to the story of an unbelievable spiritual adventure of our times. We hear of many stories of Indian saints coming to America and becoming famous but it is extremely rare to hear of an American going to India and getting respect of people there for spiritual attainments. Sahib Sadhu shows that it is possible spirituality is for everyone, God is for everyone.If we want God, God will show us the way, if we put forth the effort, God will open the door. Sahib Sadhu is an incredible book that I recommend for all young people to read. Learn what you can make of your life. This book tells the extraordinary story of Swami Satyananda Saraswati. It is a story of love, understanding, compassion and the journey to enlightenment. I really enjoyed it.